Out of everything I have seen so far, this is by far my top favorite. Excellent job! my favorite marvel pair! 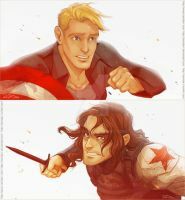 I love how cap keeps fighting for him, and bucky is beautiful I love this piece!! The winter soldier is probably my favorite marvel character and this really captures so much detail. Very nice! Oh. Oh my word. This is absolutely /stunning/. I love the way the light falls on Bucky's head in an almost angelic way. This is gorgeous. The recent movies really soured me on these two but this sort of brings back a lot of more positive emotion. Lovely! Wow, I can even feel/see (confused) he is holding his breath. oh my god this is so beautiful !!! oh my god this is so beautiful. Do you happen to have it in a tumblr post so I can reblog it? No, I don't. Feel free to post it on tumblr though. Heh as good as Gunslinger Girl was the OP still manages to be one of the the best parts of it. The Delgados are just great in general. Holy freaking gorgeous. You captured this scene perfectly. it's awesome ! i like the color you use and composition! I really like how you work with warm colors and reflections in the upper part. Daily deviation is absolutely well-deserved! Gorgeous! Totally love the scenery and the feelings. And the sun looks so beautiful shining through the water! I can recognize Captain America but not the other guy. Still, really awesome picture! Is it a movie or the character's name or....? 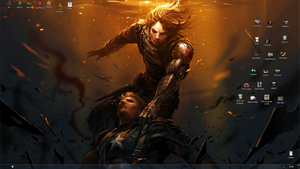 Sorry for the lack of knowledge, been meaning to watch the Captain America movie along with the Avengers. You really don't have to apologize for anything. The Winter Soldier (aka. Bucky Barnes) is the character, a former best friend / companion of Captain America during the WW2. Through some experiments he lost his memories (kinda...), so he doesn`t remember being the Captains best friend and fights him. I think he appears in both Captain America films (as a friend in "The First Avenger" and as an kinda enemy in "The Return of the First Avenger"). stunning! I love the golden light through the water!! !